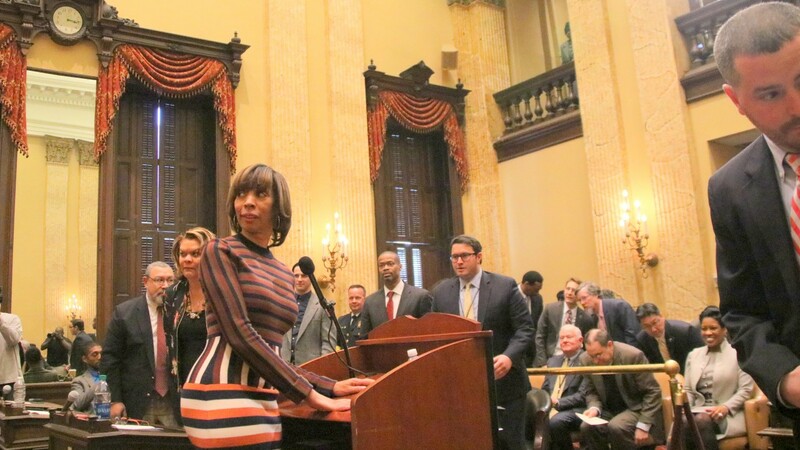 Laying out her policies and programs with enthusiasm, at one point invoking her past as a Morgan State University cheerleader, Mayor Catherine Pugh delivered her first “State of the City” address this past week. “We will get this done!” she intoned fervently, after describing her idea for a transitional housing facility for the homeless, one of several new initiatives presented in Thursday’s speech. “Cheer with me for the success of Baltimore,” she said, at the conclusion of an address that wove together her general policy positions on public safety, employment, economic development and more. Many did cheer, in a room packed with city council members and her administration’s department heads. But one group of listeners beyond City Hall, who were hoping to cheer, said they came away instead disappointed and concerned. Advocates for city schools said they heard in the new mayor’s remarks too little zeal for helping the deficit-plagued school system and too much finger-wagging about the virtues of charters and need for traditional schools to emulate them by getting more private sector support. For city middle school teacher Zachary Taylor, these remarks were a red flag. “The call for more Boards of Directors is an action that many on the right wing of education reform have called for – including the Hogan-appointed President of the State Board of Education, Andy Smarick,” Taylor said. Meanwhile activist Kim Trueheart, who is assembling a community resource group at Liberty Elementary Schools called The Village Project, thinks such an entity can make a difference. “What can be wrong about bringing together people from the neighborhood, from the business community, to do their part to support a school?” she said. Observers recognize they are parsing a few short paragraphs. Still they were part of a prepared address kicking off a new administration and come at a critical time. The school system, facing a crippling $130 million deficit, has turned to Pugh for help getting additional city and state funds before the end of the legislative session. With a Republican president and governor possibly dictating major education policy changes in the near future, meanwhile, Pugh is looking to give Baltimore – and herself as mayor – greater control of city schools. On the same day she delivered her State of the City speech, the Maryland Senate approved legislation giving Baltimore’s mayor the power to appoint the city school board. Currently, the mayor and governor share responsibility for selecting and removing board members. The pending bill (it has not yet moved forward in the House) would also transfer the role of picking a pool of school board candidates to a panel. That pool is currently created by the state’s school board. Parents and teachers were listening closely to what Pugh had to say on Thursday. “A mayor who wants control of the schools needs to be a mayor who is willing to keep her campaign promise to substantially increase city support of schools every year,” said Kimberly Coleman, spokesperson for the coalition group Baltimoreans for Educational Equity (BEE). “Public school parents desperately wanted to see a flash of bold leadership,” said Edit Barry, a lead organizer of People for Public Schools and a parent at Mt. Royal Elementary/Middle School. 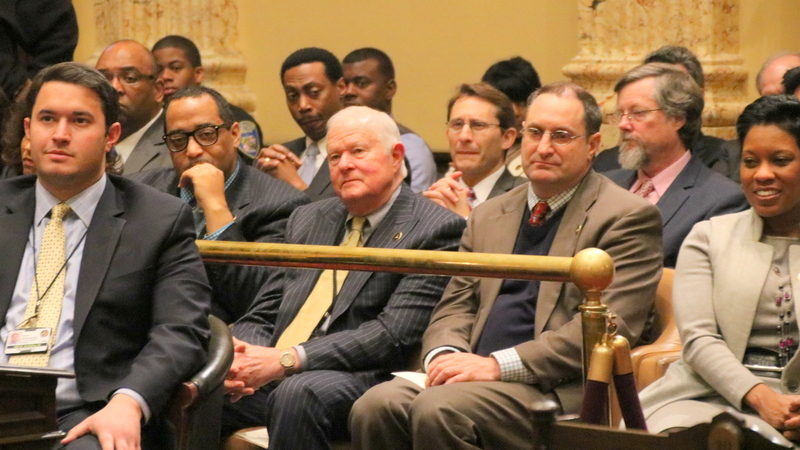 Working with lawmakers in Annapolis, Pugh has come up with a three-year, $180 million city/state funding package. But it falls short of the needed funds to prevent layoffs, large-class sizes and program cutbacks. To come up with the city’s contribution to the package, budget officials are tapping Baltimore’s “rainy day fund” and leftover snow removal money among other sources. “I also ask everyone in Baltimore to pray that fair to good weather continues with little or no snow,” Pugh said in her speech, pausing for audience laughter. At the same time that she praised charter schools, Pugh also indicated she believes they contribute to the city’s structural deficit by not hiring teachers already in the system. “The dilemma for the school system is that they must determine how, with the growth of charter public schools they manage, layoff or absorb teachers, principals and administrators that are not chosen to work in those charter public schools,” the Mayor said. Roland Park Middle School Spanish teacher Kimberly Mooney, reacted strongly to that observation. Mooney called on Pugh to live up to her campaign pledge to increase the city’s contribution to the school system budget from 20% to 35% over the next four years. “She has been spinning this campaign promise as a lofty goal rather than a commitment,” said Mooney, who calculates that keeping it would mean $50 million this year from the city. For city schools parent Melissa Schober, Pugh’s call for for traditional schools to form boards of directors and emulate charters was particularly troubling. PTOs and other groups – especially in wealthier neighborhoods where parents have the time and means to participate – already advocate and raise funds to support their schools, she said. “I am not opposed to more community or business involvement in city schools, but the fact remains: education is a constitutional right and should be funded as such, not on the charity and goodwill of donors,” she said. Traditional school, whose boards couldn’t hire principals the way charters’ boards do, would be left with basically a fundraising role. “And who determines who will get those funds? Relationships. In a city like Baltimore that means that schools with parents andcommunity members with power will reap more benefits,” she said, describing talk about more private sector participation as failure of leadership. Trueheart said she understands the critics’ concern about equity but doesn’t think the creation of community entities at schools necessarily represents an abdication of government’s responsibility to properly fund instruction. Her “Village Project,” based on the “It takes a village to raise a child” concept, will bring together people who can help strategize school-based resources for children and families – people like the local barber and laundromat operator.